The above graph from the Advanced Hydrologic Prediction Center really impresses me. Then again, I'm a geeky kind of guy who is impressed by such things. This chart represents the latest flood prediction for Downtown St. Paul. 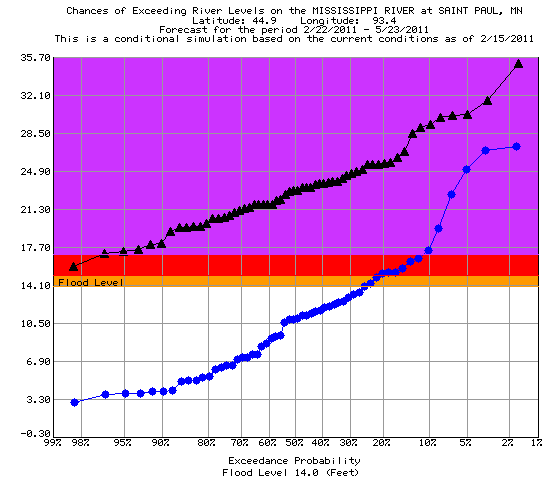 The blue line is the average probability of reaching a given water height between 2/22/2011 and 5/23/2011. River height is on the left. If you look at the furthest blue dot on the left you can see there is about a 98.3% chance of the river reaching 3.3 feet on an average year. Now look at the furthest black triangle to the left. The black triangles are predictions for this spring. You can see the prediction calls for about a 98% chance of the river reaching around 15 and half feet. That's 12 feet above average. Flood stage (represented by anything above the yellow line) is considered 14 feet and above so the odds of flooding in St. Paul this year is really good. The highest the water got last spring was 18.38 ft on 03/24/2010 which was enough for the water to start to cover Harriet Island. That was the 8th highest historic crest in St. Paul. There's about an 92% chance Harriet Island will go under water again this year. There's about a 25% chance of the river reaching a whopping 25 feet which would be outrageous and tie for the second highest crest in recorded history. This would still be just below the top of the South St. Paul right bank levy which is 26.38 feet high.